While I haven't been doing a lot of sewing at the moment, I have been getting in some quality needlework projects. A very good friend of mine is about to have her first baby... a boy. She's big into the ocean theme as her hubby does spear-fishing in his spare time. 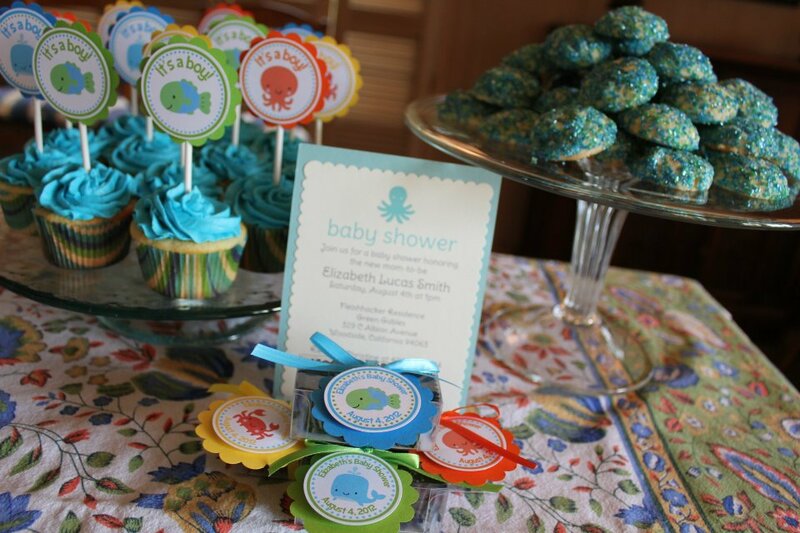 I was throwing her a baby shower so I decided to dive in (har har har) to the theme and go with blues, greens, and yellows (the house where we had the party was going to have yellow linens so I incorporated that color to the theme). Well, I found these adorable, customizable tags on Etsy, and instantly ordered them up for her cupcakes and favors. A small chocolate shop just opened down the street from me, so I had them prepare little boxes of sea salt caramels (again, with the ocean theme). I made sugar cookies and vanilla cupcakes with blue frosting. As for her gift, I crocheted my first baby blanket. It's made out of super-soft, Cascade 128 Superwash Chunky. It was so nice to work with and because it was such a thick yarn, the project came together really fast. I made it in about a month but could have finished it long before if I just had time (and if we didn't have a minor heat-wave... I hate working with yarn in ridiculous heat). I added the scalloped border on two sides instead of all four, just because I liked the finished look. The pattern was a free one that I found on Ravelry, linked here. It was a really easy project. Essentially just double crochet's for the entire length, but into the back of the previous row's stitch. I watched a video and off I went. And the final scalloped edge was so easy too. I almost omitted it because I didn't really want a feminine frill to it, but I think it works. Oh, and I haven't mentioned it, but when I met up with Miss Crayola Creepy, she convinced me to sign up for Instagram. I'm really new to it, and am just trying to remember to take pictures and load them up, but it's pretty fun. Please feel free to follow me on it and I'll follow you back. My username is whatsupcupcake. What a beautiful blanket! I love the muted colour! I've always wanted to learn how to crochet. I'm so slow at knitting though, I've never got around to learn how to crochet. I hope the baby shower went well. Those cupcakes look gorgeous and I love your printables! I love the blanket. What a great colour. I've always wanted to learn to crochet but have never had the chance. My mother was really good at it but she said she lost all her patience trying to teach my sister how to knit and crochet (who I guess was really, really bad at it!) so I was out of luck! Nice job on the blanket! I love crocheting for the fact that it's quick and easy, and you can bang off a last-minute gift in no time! :) I love that you chose grey for a baby blanket too. I adore unconventional colours for babes! Looks like a lovely party! The blanket is beautiful, the color reminds me of the ocean. The blanket turned out so lovely, and the edges are just divine! It looks soft - definitely a perfect gift!